Back in the days before we eliminated dairy from our diet Felipe and I were huge nacho snobs. We ordered them wherever we went and became pretty tough critics. Everybody likes their nachos a little different but the following criteria would give nachos a higher score in our book: gooey enough that you needed a fork, black bean (opposed to any other), jalapenos, and most importantly, no chip left un-cheesed. Now a days with great cheeses on the market like Daiya, it’s relatively simple to mimic things like nachos. Here at the DFV household we really like the cheesy flavor added to food and it is definitely not in our budget to add store bought cheese to everything so we usually prefer to make our own. If you are in the same situation, or you try to stay away from store bought processed food or maybe you just like the satisfaction of making it from scratch this recipe is for you. For us it is all about the assembly but feel free to do it how ever you like for nachos are a very individual thing. If I wasn’t allergic I would definitely add guacamole to put these over the top! Preheat oven to 375. Mix ingredients from cashew cream to garlic powder together. Melt butter over low heat. Slowly whisk flower into butter. Whisk in cashew cream mix. We usually make one big plate (a pie dish works perfect) and one small plate that we can simplify for the Little Vegan though you may plate them them however you like to serve them. When we make them we do it much like you would a casserole, in layers. Start with a layer of chips, some black beans, salsa, jalapenos and spread with some cheese. I usually try to save some of the jalapenos and salsa to put on top when I serve. Then start over with cheese sauce on top. Bake for 10 minutes. 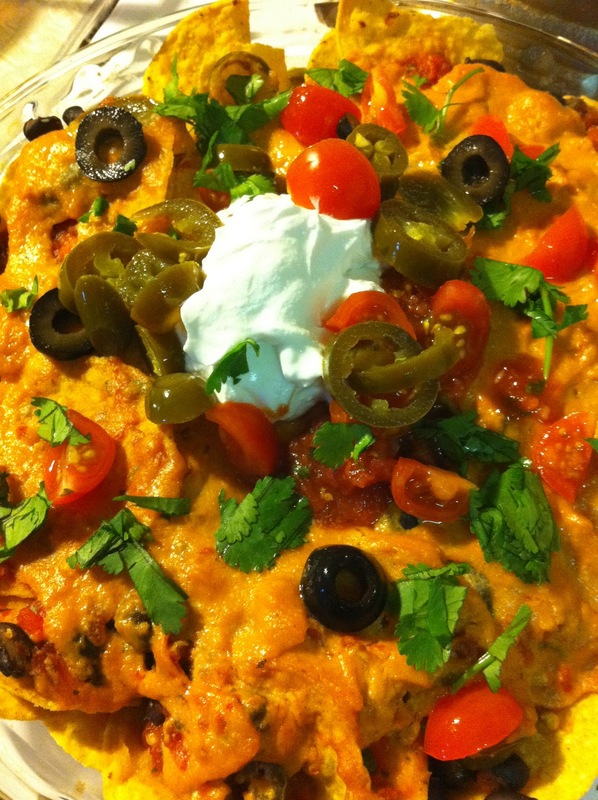 Top with sour cream, tomato, salsa , jalapeno, cilantro and olives. grab a fork and eat. Gallery | This entry was posted in Anzia's picks-a young vegans perspective, Main Course. Bookmark the permalink.